The Stony Brook Film Festival was hosted at the Staller Center for the Arts, Stony Brook University. Stony Brook, NY - July 26, 2014 - U. S. Premieres of foreign films took the top awards at the 19th Annual Stony Brook Film Festival, ending Saturday night July 26 with a reception hosted by John Anderson, film critic and master of ceremonies. Stony Brook’s ten-day festival screened films each evening at Staller Center for the Arts at Stony Brook University. Opening night was sold out, with over 900 in the audience for Ralph Macchio’s short film, Across Grace Alley, followed by the U.S. Premiere of the German film Back on Track from Beta Cinema. Alan Inkles, founder and director of the Festival, greeted European and American filmmakers at the awards night, following the New York Premiere of Erik Poppe's 1,000 Times Good Night starring Juliette Binoche. U.S. Premiere from France/ Luxembourg/Belgium. Directed by Vincent Lannoo. Written by François Uzan. With Stéphane Guillon, Julie Gayet, Jonathan Zaccai, Pierre Richard. An Artémis Productions, Samsa Film and Liaison Cinémtographique Production. From Films Distribution. In this quirky comedy from France, a funeral speech writer, a mother and her son, a man who may be a ghost, and a neighbor, all come together in a charming story of loss and love. The writer gets a new lease on life when he meets a widow who commissions him to write a piece about the father of her eight-year-old son. U.S. Premiere from the Netherlands. Directed by Maarten Treurniet. Written by Marnie Blok, Darin van Holst Pellekaan. With Monic Hendrickx, Lisa Smit, Barry Atsma, Sallie Harmsen, Eva Bartels. A Fu Works Film. From Eye International. A big-screen adventure based on the story of a woman folk hero who led the defense of the Dutch city of Haarlem in 1573. Canada - Directed by Michel Poulette. Written by Pierre Billon. With Roseanne Supernault, Graham Greene, Ipelie Ootoova. Michel Poulette’s career is a long list of success stories with all of Quebec and Canada’s major broadcast networks. The TV programs and features he has worked on have consistently been among the highest rated. He also works for American networks Showtime and Lifetime. This award is for his direction in Maina, introducing the fascinating civilizations of the Innu and Inuit tribes living in North America six hundred years ago. Directed by Hiner Saleem. Written by Hiner Saleem and Antoine Lacomblez. As Govend, the teacher in My Sweet Pepper Land, Golshifteh Farahani’s performance wins special recognition. Farahani won a Best Actress award at the age of 14 for her lead in Dariush Mehrjui’s The Pear Tree and is an accomplished musician. She was the first Iranian star to act in a major Hollywood production, Body of Lies, by Ridley Scott in 2008. She is fluent in French and English and now lives in Paris. A funny and original short in which two would-be bank robbers run into trouble when each takes exception to the other’s mask. USA – A film by Curtis Adair Jr.
A race riot that devastated a black community in Tulsa, Oklahoma in 1921 is the setting for this powerful short in which a biracial cop passing as white pleads with his black mother not to get involved in the protests. Produced by Curtis Adair Jr. while a film student at Florida State University College of Motion Picture Arts, Tallahassee. A lone cosmonaut adrift connects with a radio operator in Italy. Produced by Andrej Landin while a film student at Chapman University in California. Gravity and Into the Silent Sea screened at the Telluride Film Festival at the same time Alfonso Cuarón’s Gravity premiered. John Anderson, film writer for The New York Times and Newsday among other publications, presented the awards at a reception following the Closing Night film, 1,000 Times Good Night, with Juliette Binoche and Nikolaj Coster-Waldau, in a New York Premiere from Film Movement. Accepting the Audience Choice for Best Feature was Eva Bartels, who played Alda in Kenau. The Dutch actress is working on projects in New York this summer and attended the festival to introduce the U.S. Premiere of Kenau earlier in the week. The Jury Award for Best Feature for Paper Souls was accepted by François Uzan, the screenwriter of the film making its U.S. Premiere. He flew in from Paris to attend the awards reception and meet and greet Stony Brook’s filmgoers. The Audience Award for Best Short was accepted by Curtis Adair Jr., whose short, Little Africa, made its N.Y. Premiere at the Stony Brook Film Festival. Lucas Spaulding of Sequestered sent a video acceptance using footage from his film. Andrej Landin of Into the Silent Sea sent a note of thanks from his home in Sweden. Presenting sponsors of the Stony Brook Film Festival are HBO, Suffolk County, Teachers Federal Credit Union, The Village Voice and WALK 97.5 Radio. As in past years, there was no Entry Fee to submit a film for consideration in 2014 thanks to the sponsors’ support of the Festival. Staller Center for the Arts, Stony Brook University’s cultural showplace, is located in the center of campus and has been the home of the Stony Brook Film Festival every summer since its beginnings. Staller Center offers over 200 performances annually in dance, music, art, theatre, and film from around the world each season. Kenau; John Anderson, film critic and M.C. 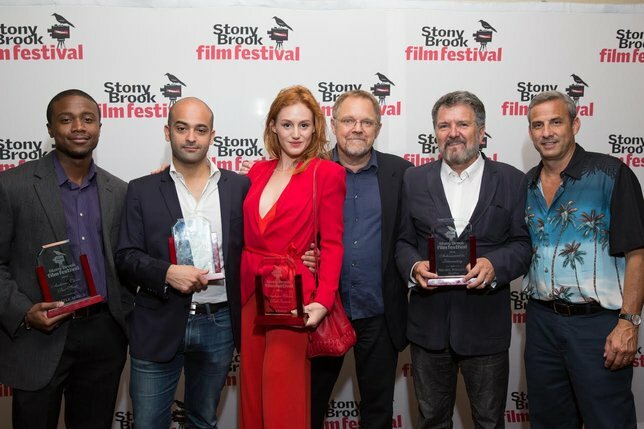 ; Michel Poulette, director, Maïna; Alan Inkles, founder/director of the Stony Brook Film Festival. Subject: LongIsland.com - Your Name sent you Article details of "Winners of the 19th Annual Stony Brook Film Festival Announced"